Capcom Mobile swings in with another mobile port, with Phoenix Wright: Ace Attorney on the mind. The Dual Destinies Android version is now available for $19.99, almost four years after the original title released for Nintendo 3DS. The fifth chapter in the Ace Attorney series welcomes Phoenix Wright back into the courtroom after an eight-year hiatus, and he’s back to call evil-doers out on every objection. While iOS users have been able to take advantage of the port since 2014, the game was released for the platform in episodic format. If you’re not looking forward to that being the case for Android as well, no worries, the Android package will be a one-time buy, just like the 2013 3DS game. Point Your Way to Victory – The intuitive interface includes useful features such as a backlog for you to re-read testimony and story dialogue. Immersive Investigations – Freely explore 3D crime scenes. Fast-Paced, Entertaining Trials – Dismantle lies and resolve contradictions between witnesses’ words and the evidence. Colorful Cast of Characters – Join Phoenix Wright and his junior lawyers as they confront an all-new cast of interesting, amusing, and sometimes outrageous characters. Surprising Twists – Delight in solving the mysteries and smile at the characters’ amusing and often ridiculous shenanigans. The drama and dialogue will keep you laughing, crying, and guessing until the very end! Lighthearted Additional Content – Dress the three lawyer protagonists up in costumes and use them in the main game for some unintentionally humorous trials! Bonus Case – Defend a wrongfully accused killer whale. Google Play Games Support – Transfer save data between multiple devices. 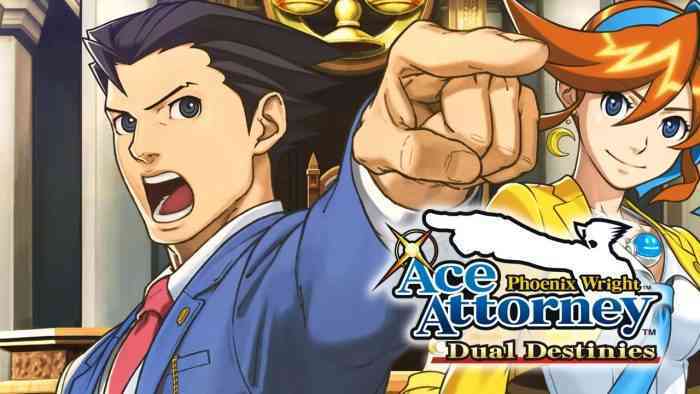 Phoenix Wright: Ace Attorney – Dual Destinies is out now for Nintendo 3DS, iOS, and Android.